Victoria Hotspurs with one of the GoTo cars. 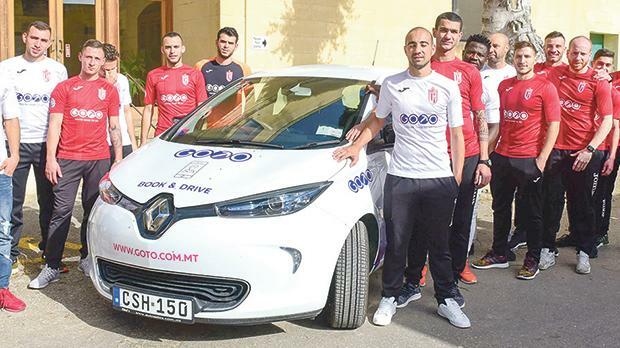 Malta’s new green transport initiative, GoTo, has been announced as an official sponsor of popular Gozo football club, Victoria Hotspurs. With more than 1,000 motorists already registered with GoTo across Malta, the newly-launched initiative offers an increasingly popular, environmentally-friendly alternative to private petrol-fuelled cars. The car-sharing initiative, which is currently rolling out a fleet of 150 electric cars nationwide, provides easy, convenient and green transport for its registered users across the island, as well as designated, strategically-positioned parking spaces at each destination. GoTo’s rapidly-growing success has now led it to become an official sponsor of one of Gozo’s most historic football clubs, Victoria Hotspurs. “Victoria Hotspurs FC is extremely thankful to GoTo Malta for becoming the team’s official sponsor,” Victoria Hotspurs president Anton Tabone said. Formed in December 1948 by Antoine Mercieca, the original Victoria Hotspur was named after Dr Mercieca’s favourite football team, Tottenham Hotspur. This year the club celebrated its 70th anniversary, with a 2017-2018 season that saw the Victoria Hotspurs back as league champions for the 12th time, and Victoria Hotspurs player Christian Mercieca winning the award for Gozo Football Player of the Year. During this season, the club’s Gozo premises were also refurbished to mark the occasion, and the team participated in an exclusive training camp in Manchester, UK. GoTo was formally launched as the official sponsor of Victoria Hotspurs Football Club on Monday.